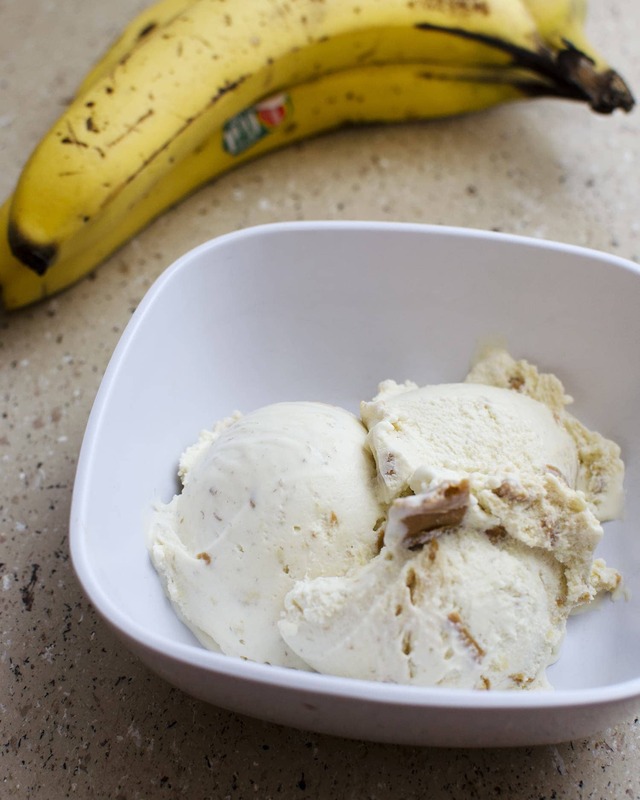 A creamy, rich, and luscious banana ice cream with the perfect combination of peanut butter swirl added. Because I decided to do a one flavor cake for Nate’s birthday – triple chocolate cake – I decided I should make a fun flavor of ice cream to accompany it. Nate and I are both fans of banana flavored things, and of course you know we both love peanut butter. So I decided to make banana ice cream with a peanut butter swirl. I was inspired by this delicious looking ice cream from Hungry Housewife. I was slightly terrified to make ice cream with egg yolks in it, especially because last time I tried it was a little bit of a disaster (We were making mango gelato and the recipe had egg yolks in it – it turned out super creamy and the texture was awesome, but just the fact that the gelato was very yellow we couldn’t get the idea out of our head that we were eating eggs so it was very gross!) But this time I followed the instructions exactly and the ice cream (or actually custard) was very creamy, rich and luscious with a perfect banana taste and just a few bites of perfect peanut butter intermixed. Put a large sauce pan on the stop top. Add in whole milk, heavy cream and vanilla extract. Heat over medium until small bubbles start to form (not a full boil). Remove from heat. Meanwhile in a medium bowl (or stand mixer), whisk egg yolks quickly until the start to lighten a bit (this may take a few minutes). Add sugar into egg yolks, while continuing to mix. Once that is fully mixed in, add more milk 1/4 cup at a time until fully mixed, until half of the milk mixture is added. Add the mashed banana and try to mix in as well as you can. Pour the tempered egg mixture back into the sauce pan with the rest of the hot milk. Cook the mixture on medium low heat until it starts to thicken, and reaches 170 degrees. Pour the mixture into a large bowl and allow to sit at room temperature until it stops steaming. Place bowl in the fridge and allow to cool for 1 hour, (up to overnight). Meanwhile take peanut butter and spread it on waxed paper, like you would butter toast. Place in freezer and allow to harden. Remove from mixer and enjoy now or place in a bowl with a lid to allow ice cream to harden more. Love the combination and if wasn’t winter here now, would go for some of your ice cream too! I must make this ice cream! peanut butter and banana – one of the best flavor duos ever. And the vertical shots are gorgeous! Let me know if you make it. Ice cream is one of the hardest things for me to get a good picture of! And I agree, there are a few combinations that equal perfection. Peanut butter and banana is one of them!